Ashley's Green Life: Going Green...One Diaper Change at a Time! So it probably doesn't take a rocket scientist to guess where I stand on the "diaper debate" between cloth and disposables, since my blog is titled "Ashley's GREEN Life!" But honestly, it wasn't always that way. Before and during my pregnancy, I was pretty set on using a "greener" style of disposable diapers called gDiapers, which have a reusable cover and bio-degradable inserts (which you can flush down the toilet or compost). But during one of my prenatal appointments with my midwife, she gave me a quick demo of the cloth diapers she uses and she told me about a local cloth diapering service...from that point on I was sold! I contacted the local diapering service, Metro Cloth Diapering, and the owner came and did a quick and informative demo for Brandon and I, and we both agreed that it would be great fit for us. Then a few weeks before Avery's birth, I received all the supplies I needed to start cloth diapering once she was born, from the company. The "inner nerd" in me wanted to start practicing right away with the cloth diapers, (I even considered bringing a pretend baby home from my preschool class, but I couldn't find one that was the right size-lol!). But it wasn't long before Avery was born and I got all the practice I needed. We started using the cloth diapers with Avery from day one and they have been amazing. Brandon and I both picked right up on how it is done and I can't imagine using any other kind of diaper. 2- I had no idea where to get started in shopping for cloth diapers. There were so many decisions to make: pre-folds or pocket diapers, bumGenius or FuzziBunz, Velcro or snaps? Yikes! 3-I worried that if I used a diaper cleaning service that they would use harsh detergents or chemicals to clean the diapers that would not be good for my baby's skin or the environment. 4- On top of that, if I used a cleaning service, I worried it would be really expensive. But the one thing that changed my mind about cloth diapers is the use of a diaper cleaning service. As I mentioned above, I use Metro Cloth Diapering that serves the Kansas City Metro area. 1-Cleaning the diapers? They clean them (score!). 2-What cloth diapers to buy? They provide the diapers, covers, and wipes meaning I don't have to do any shopping or make any large investment into buying my own supply of cloth diapers. 4- Cost? It's about $22.50 a week for the service which includes a weekly pick up of dirty diapers and drop off of clean diapers. Not bad if you figure the you'll probably be spending something close to that on disposables and wipes per week. Here's a few more details about what I get with my diaper cleaning service. Included in your weekly cost you receive the following supplies: a set of pre-fold, cotton, cloth diapers (this means it's like a flat piece of fabric with a thicker layer in the middle). As well as: a set of flannel wipes that are handmade and in fun patterns, 5 water-proof diaper covers (these keep the cloth diaper portion from getting the baby's clothes wet or dirty), and a Snappi (a little rubber/plastic piece that holds the cloth diaper together...basically takes the place of safety pins that were used back in the day to hold together cloth diapers.). You can read more about these products on their website here. Aside from this, Metro Cloth Diapering, obviously cleans the cloth diapers too. Once a week I put out the bag of dirty diapers/wipes, it is picked up, and clean ones are dropped off. You can read a more in-depth description of their services here. They make it pretty simple don't they? Now why turn to cloth diapers in the first place? Clearly cloth diapers are great for the environment in how they decrease landfill waste, but one might argue that you have to use an awful lot of water to wash and reuse them. That's true, but a key word in that statement is reuse! You can get many uses over many years out of a single cloth diaper, whereas with a disposable it's just that...you use it once and then you dispose of it. And on top of this, disposable diapers take years and years to breakdown (if ever!). I read once that if the children who came over with Christopher Columbus wore disposable diapers, those diapers would still be around today...since they plastic would never break down!! Check out this video about the breakdown of a disposable diaper (or lack there of). This video also highlights the gDiapers I mentioned above, which are still a great option if cloth is not something you want to attempt. Aside from the environmental affect, disposable diapers also contain a number of harmful chemicals and dyes that may be making diaper changes easier on parents (because they are super absorbent), but they sure aren't helping babies. One chemical called, sodium polyacrylate, is added to disposable diapers to make them "super absorbent" but it can also cause skin irritations and rashes, and it was banned from tampons back in the 80's because of it's link to Toxic Shock Syndrome. Another little chemical in diapers is dioxin, a by-product of them being bleached. Dioxin is a cancer-causing chemical and is banned in most countries (obviously not the US). Last is chlorine, which gets them nice and bright...and at the same time is "particularly threatening to infants." Feel free to read more of these chemicals here. Although some may say the effect of these chemicals is small, it's not something I'm willing to take a chance on with Avery, which is why I chose to use cloth diapers. Fabric wipe, cloth diaper, diaper cover, and Snappi. 2. Place a clean cloth diaper down on the changing surface. Sometimes this is needed, other times it isn't, but it's better to have something down in case she decides to go again...which happens quite often when she talks to her buddy Panda! 3. Speaking of Panda...I usually put something next to her to occupy her while she is being changed. Here she is having to make the toughest decision of who to look at: Daddy or Panda, who will it be?! Well, since Daddy was the camera man, Panda won this battle. 4. Next I take off the diaper cover, and then the dirty diaper. 5. The dirty diaper now goes in the medium-size wet bag. 6. Next, I grab a cloth wipe. I use this Prince Lionheart Wipes Warmer...it's pretty awesome! I don't necessarily care for the fact that the wipes are warm (although I bet Avery does), I just like that I have a stash of already WET wipes. All I do with these fabric wipes is run a stack of them under some water, wring them out a bit, then stick them in the wipe warmer...then they are already to go! Again, all I use on these cloth wipes is WATER! No chemicals, lotions, perfumes, anything!!! 7. Now I give her a nice clean wipe, and then place the dirty wipe in the medium wet bag with the dirty diaper. I usually takes about one wipe per diaper change, sometimes two if she has a BM. When she was first born, we actually used to use 3 for each diaper change! Why? I have no idea? Guess we just thought we had to get her really clean-lol. Now we're more experienced with it and one sure seems to do the job! During this time I also I give her a minute or two to air out (if I'm not in a hurry), I find it helps keep her rash-free. On top of this, I make sure to give her at least 30 minutes a day of "diaper-free time" where I put a cloth diaper or two under her and just let her chill out without her diaper. This usually takes place during tummy time. 8. Now it's time to put on the clean diaper. This is where the one she's been laying on comes in handy. I simply fold the sides in a bit and pull it up towards her belly button. 8. Pull the back corners of the diaper to the front and hold them there. This is the part she doesn't like sometimes. If she had it her way, she'd be naked all day-lol! "Oh Mom! Not another diaper!" drama for the diaper change. 9. Next, I use the Snappi to connect the two sides of the diaper together. You can see the Snappi connects the left and right sides of the diaper. 11. Time to put on the diaper cover. Some diaper covers that we have use Velcro, others use snaps, and they come in a variety of colors. Just a note, we are in charge of washing these covers (they are not included in our pick up and drop off...the same goes for the medium-size wet bag). But if that's all I have to clean, I don't mind one bit! Here's a tip: make sure none of the cloth part is sticking out of the sides of the cover because when the cloth part gets wet it will leak out to the sides, which you obviously do not want! Bad Idea! The diaper is sticking out and will probably leak. Good idea! No diaper is sticking out=less likely to leak. 13. What to do from here? Usually once the medium-size wet bag gets full (about once a day), I empty it into my large wet bag (which I keep in a laundry hamper). Amazingly, I find that this bag doesn't really smell too bad. Of course when you open it, it smells, but when it's all zipped up, I don't smell it. As of now, I think her dirty diapers smell a bit like buttered popcorn or butterscotch, (Brandon doesn't quite agree), so perhaps that helps. Granted Avery is not eating solid foods yet (which I've heard can add to the stink factor), so if the large wet bag does start to get an odor, I'll probably start keeping it out in our garage. 14. When "Diaper Day" rolls around (once a week), I haul the dirty diaper bag from the hamper down to my front porch. 15. Now the dirty diapers are ready to be picked up. By the way, cloth diapers also work great as make-shift blankets...as you can see in this pic below. 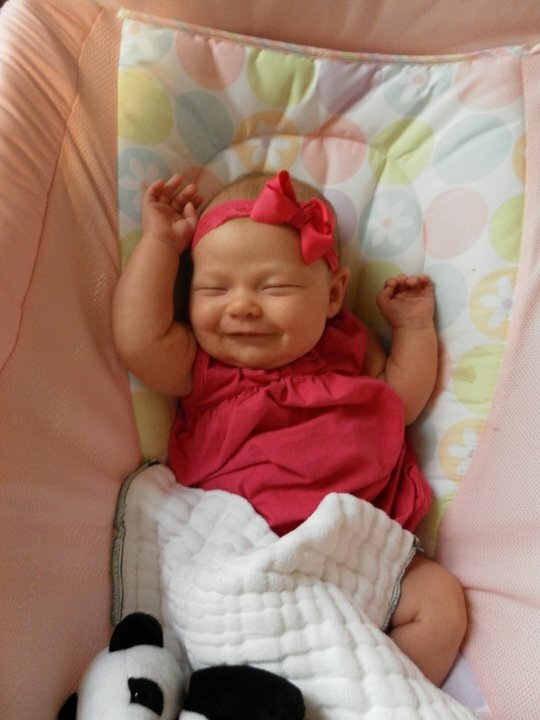 Thanks to my mom who captured this happy smile as Avery was waking up from a nap one day. Cloth diapers sure make me happy! So that's how we go green...one cloth diaper change at a time. I hope this helped you learn the benefits of cloth diapers, how easy they are to use, and what it's like to use a diaper cleaning service. Again, if you live in the Kansas City metro area, I highly suggest Metro Cloth Diapering, the company I use. They make my life so much easier and I am so thankful to have found them! Has anyone else ever used cloth diapers or a diapering service before? What was your experience like? Do you have any favorite types of cloth diapers, tips or tricks? Feel free to post below! Last, here's a cool cloth diaper awareness campaign if you're already into cloth diapers or looking to ease in called: Change 3 Things, which is looking to get 100,000 parents to pledge to change at least 3 cloth diapers a day for a year. The end result, being..."30-50 million pounds of prevented landfill waste, 100 million disposable diapers not being purchased, and $24 million of combined savings for cloth diaper families." Pretty amazing right? I know I'm signed up for the challenge, how about you? Sounds like our babies are around the same age! So cool that you also cloth diaper and are working towards a greener lifestyle. Now that I've got 9 months of cloth diapering under my belt I do feel more comfortable with the idea of washing my own cloth diapers. Kudos to you for taking your "greenness" to the next level in doing this. My sister-in-law is due in May and is thinking about washing her cloth diapers herself so I'm curious to see how she does it. Look forward to hearing from you in the future, and thanks for sharing that washing on your own is not as bad as it seems!